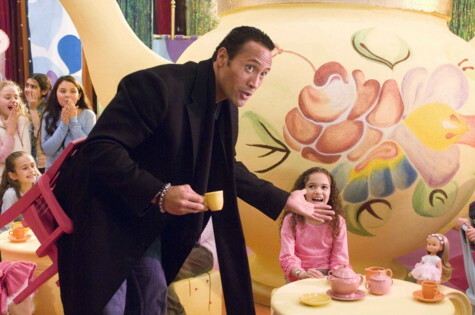 What does tea time with The Rock go for at auction these days? What if Tom Brady found out he had a kid from a previous relationship … would that affect his life? Wait … bad example. In “The Game Plan”, Dwayne ‘The Rock’ Johnson is the number one football player in America – essentially a combination of Brett Favre, Terrell Owens and Michael Vick (before he let the dogs out). He’s got the athleticism, looks and media savvy necessary to conquer the world … that is, until the daughter he never knew existed appears on his doorstep unannounced. From there, it continues the formulaic theme and hits all of the plot points you would read about in script-writing 101. Normally, I’d roll my eyes and change the channel. However, the casting department rounded up a good lineup of actors to turn something so trite into the sweet, afternoon diversion this film has become. Of course, having The Rock take on this role is a no-brainer. He’s a former college football player, WWE wrestler and movie audiences have enjoyed his mix of action and comedy from the beginning of his film career (If “The Scorpion King” wasn’t an action-comedy, you tell me what it was). Here, his football background comes in handy but I won’t even begin to say that the filmmakers seemed to care if the sport was depicted accurately. No, what came in most handy for Johnson was his engaging personality and charm. Even as he begins the film as the ego-maniacal star-athlete, it’s hard not to like him … once he begins to re-prioritize his life, I’m sure many a lady (and a few guys) started to swoon. To match up with The Rock’s tough facade (wrapped around a cuddly teddy bear), adorable Madison Pettis tackles (pun intended) the role of his daughter. She’s so precocious and cute, especially in pursuit of the two things that matter most to her in life: ballet and forging a relationship with her father. While some of the more dramatic moments aren’t within her thesbian reach, all of the light-hearted and funny moments are pulled off wonderfully and one can’t help but root for the two of them to become a happy family. Surrounding these two is a good supporting cast. Kyra Sedgwick takes time off from berating people in interrogation rooms to play an agent … hmmm, not much difference really … but still fun. Her interplay with Pettis is done quite well and her character’s money-minded sensibility helps to contrast with Johnson’s burgeoning paternal feelings. Roselyn Sanchez plays the ballet teacher, who of course develops a relationship with The Rock. Her tough attitude (with a heart of gold) works within the dynamic of the film, as Johnson does so well at being the scolded child trapped in an adult body. The Rock’s teammates also add a humorous and touching element to the film, with Hayes MacArthur being the dumb, good-natured jock, Morris Chestnut providing The Rock with fatherly advice because of his own family and Jamal Duff playing the lineman whose ultra-gruff exterior belies the sweetest heart. And it’s Duff who steals his scenes, with very little help from the script (get him more work, Hollywood). His character is very reminiscent of Lennie from John Steinbeck’s Of Mice and Men – playing a large, overpowering man with little to say but who relishes spending time with Pettis, helping her choose dresses for her doll and bringing tears to my eyes to see him care so much for her when she gets into trouble. He’s the epitome of the protector archetype. Speaking of touching moments, the ballet performance is nothing too special from a dancer’s perspective (or so I would think, dancing gets in the way of naps and beer). However, to see the football team react to the show with childlike wonder and awe put a stupid grin on my face that I’m glad no one was around to see. If you don’t smile at that, there must be something wrong with your medulla oblongata. All of that praise aside, if you’ve seen the trailer, you’ve seen the film. There aren’t any surprises and it’s not an emotional journey we’ve haven’t seen a hundred times over. But it kept me engaged and made that afternoon a little brighter. An ultra-cute, family film, “The Game Plan” delivers what it promises and I’ll admit to having a smile on my face and a tear in my eye – even with the simplicity and cliché nature of it all. A solid 3 out of 5, if you’re looking for something safe for all ages or just need a little good-natured fun to balance out your debauchery, this one goes right through the uprights. Thank the free Starz weekend and a DVR for me seeing this. You were way too generous – especially for the casting choice in Dwayne “The Rock” Johnson. The story and script were quite formulaic, only warranting a 2 of five. Dwayne’s performance was only on par with the 2… He looked awkward in the football scenes (he wasn’t a quarterback), he has little emotional depth as an actor, and he sang… Poorly. I get what you’re saying … I’m more of a softy than you are though. Sobering Conclusion is powered by	WordPress 3.1.4 and delivered to you in 0.346 seconds using 36 queries.